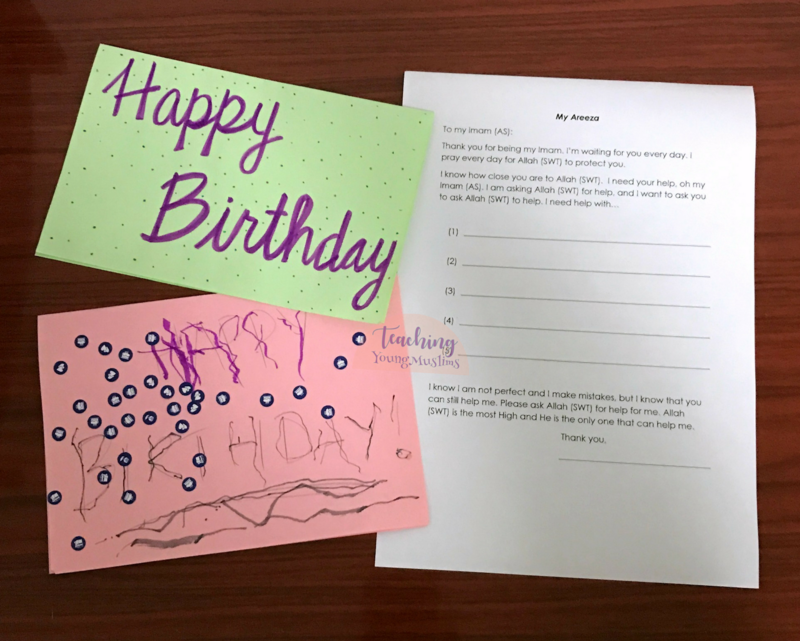 For the birthday of Imam Zamana (AS), we made a birthday card! On the inside of our birthday card, we put our Areeza. An areeza is a letter that we write to our Imam (AS). We can ask him for help for whatever we need, and then we can send him that letter by putting it in the sea. The Imams (AS) are closer to Allah (SWT) than we are. When we want to ask Allah (SWT) for something, we can ask THROUGH our Imams (AS), and we can get our prayers and wishes answered more quickly. An areeza is a way we can do that. Many people choose to write an areeza to our 12th Imam (AS) on his birthday! For our Areeza, I decided to take the Areeza I found here and super-simplified it for a kids’ perspective. The letter in our Areeza is NOT an accurate representation of the original Dua, but it contains a little bit of the message in a kid-sized way. You can download our version of the Areeza in the Teaching Young Muslims Resource Library! Enter your name and email address here to receive the password to access these downloads. Did you love this activity? Was it helpful for your kid? I’d love to hear — leave a comment below and share your thoughts! All praise to Allah the almighty,the glorious the forgiven of all sins.salawat on the holy prophet and his family.I would like to congratulate all momineen and nominated on the birth anniversary of our 12 imam(as).I ask forgiveness from god and the hope that he will surely grant me my duas.ya imam I ask for your quick reappearance.ihope to be with you in your army of 313.inshallah.You know what is in my heart oh imam(as).please keep me and my family away from sins and bad deeds.Help us imam to stay on the right path.please grant me what is in my heart for you see all and hear all.alajal alajal ya imam zamana al Ajmal.Blessings be on Muhammad(Saww)and his holy household.